The face of John Howard Van Amringe (1835-1915), with his fashionable low-hanging whiskers, is one of the most recognizable in Columbia’s visual history. Van Amringe graduated from Columbia College in 1860 and began teaching courses in mathematics that same year. Fifty years later in 1910, he retired as the much-esteemed Dean of Columbia College and Chair of the Mathematics Dept. He was soon commemorated with a series of portrait busts by alumnus sculptor William Ordway Partridge (1861-1930). Two replicas of this bust were commissioned in bronze in 1912 and 1913 and were installed respectively in Hamilton Hall and the Columbia Club. A third, cast in 1922, was destined for the eponymous tempietto-styled pavilion that still exists outside Hartley and Wallach (formerly Livingston) Halls. On June 8, 1962, vandals reportedly toppled the bust off the pedestal and caused extensive damage. The bust was either repaired or replaced, and reinstalled in December of that year. In Fall 1987 the memorial underwent conservation efforts to refurbish the pavilion structure. 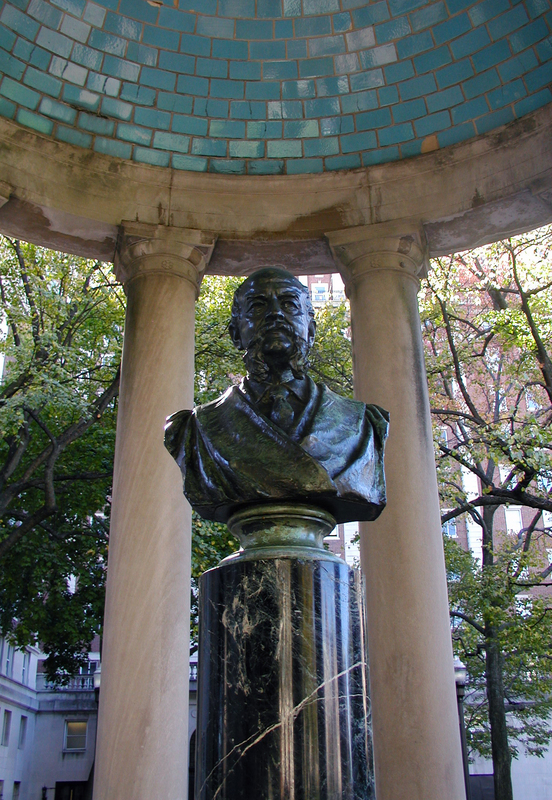 Built to commemorate one of Columbia’s most important administrators, the Van Amringe Memorial and Quadrangle remains today one of the most popular areas for outdoor study and socializing on the grounds of the Morningside campus. To read the Columbia Spectator in digital format, consult the Columbia University Libraries’ Digital Collections, or go to http://spectatorarchive.library.columbia.edu/. 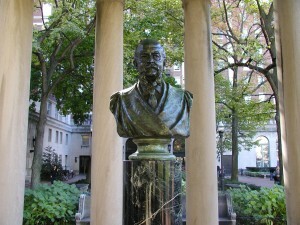 Image: William Ordway Partridge, John Howard Van Amringe as installed in the Van Amringe Memorial, designed 1912, cast and installed in 1922, bronze on a marble pedestal, H. bust: 33 in. 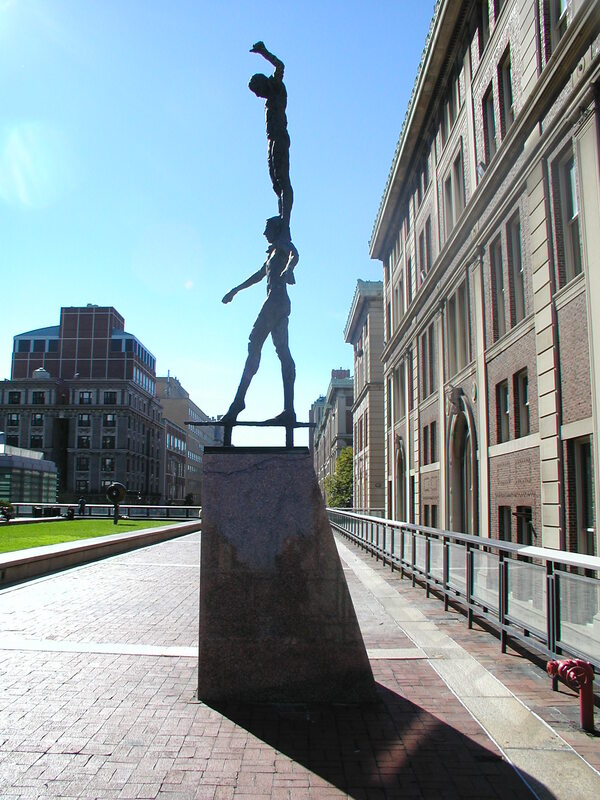 (83.8 cm), University Commission (C00.1254). 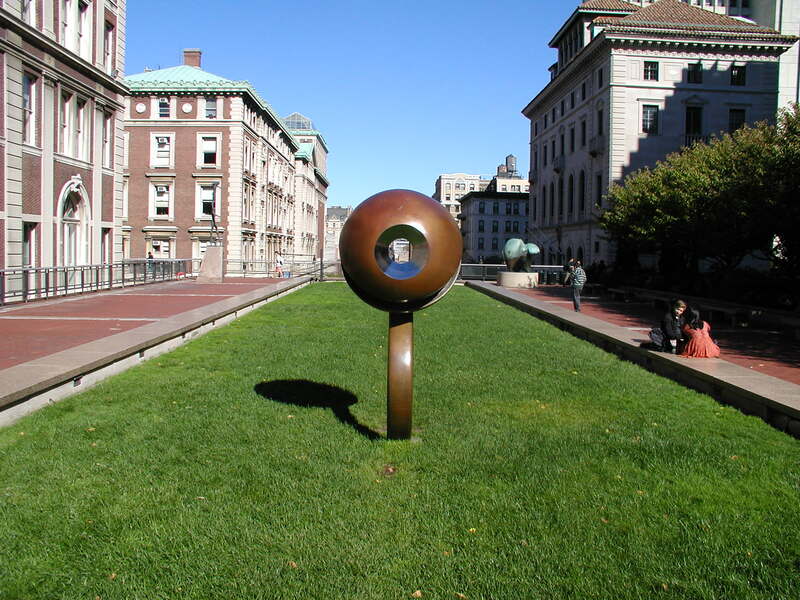 Photograph: Michael J. Munro, Art Properties, Avery Library, Columbia University. This entry was posted in Morningside and tagged AP photos, J.H. Van Amringe, William Ordway Partridge on April 8, 2015 by Roberto Ferrari. Here are a few new photos of the some of the public outdoor sculptures on the Morningside campus, taken by Art Properties student assistant Michael J. Munro (GSAPP, Historic Preservation). 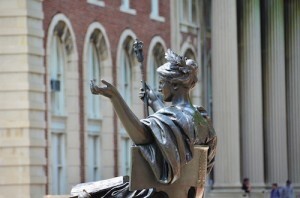 If you want to send us your photos and possibly see them on the blog, email us at artproperties@library.columbia.edu. 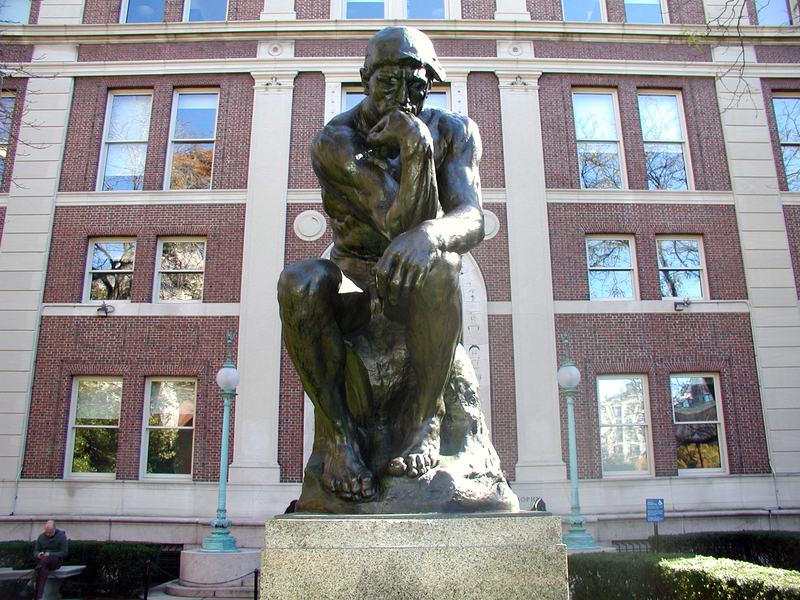 This entry was posted in Morningside and tagged AP photos, Auguste Rodin, David Bakalar, J.H. Van Amringe, Kees Verkade, Life Force, Thinker, Tight Rope Walkers, William Ordway Partridge on November 14, 2014 by Roberto Ferrari. 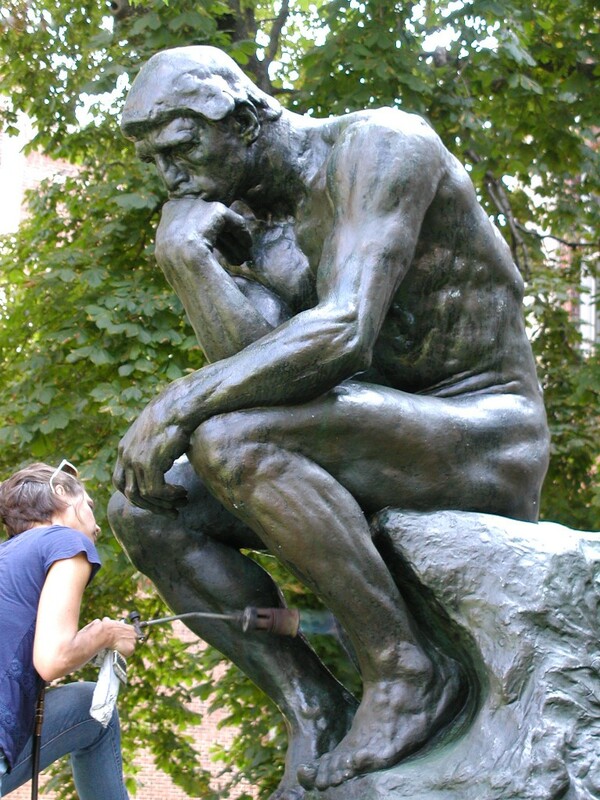 If you are strolling around the Morningside campus this week and next week, you will notice people working in the hot sun treating three bronze sculptures: William Ordway Partridge’s two statues of Thomas Jefferson and Alexander Hamilton, and Auguste Rodin’s The Thinker. 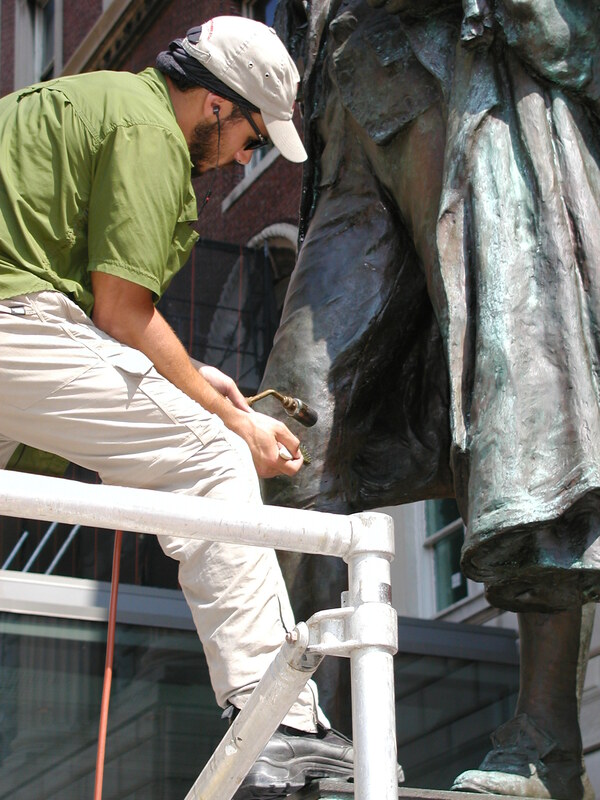 Conservation Solutions has been contracted to clean, treat, patinate, and rewax these statues and their pedestals, to freshen them up and stabilize the condition of each sculpture. Since the statue of Jefferson outside the School of Journalism is celebrating his 100th birthday this year, this seemed like a great opportunity to give him a “facelift.” Similarly, Jefferson’s partner Hamilton, installed in 1908 outside Hamilton Hall, needed cleaning and treatment. Unfortunately, the Rodin sculpture recently had been vandalized, someone having brushed and sprayed gold paint onto parts of the statue, so it too needed treatment to remove the paint and restore the statue’s protective wax finish. The two pictures you see here show the conservators using blow torches for the application of hot wax. As noted on this blog, the care and protection of public outdoor sculpture is costly, but critical to the long life of these beautiful works of art. Stay tuned for more news about conservation and the public outdoor sculpture at Columbia, and say thank you to the staff from Conservation Solutions! This entry was posted in Morningside and tagged Alexander Hamilton, AP photos, Auguste Rodin, conservation, Thinker, Thomas Jefferson, William Ordway Partridge on July 24, 2014 by Roberto Ferrari. University Archives, in RBML, recently released this archival photograph showing the back of Thomas Jefferson by William Ordway Partridge (1861-1930). This statue of the third President of the United States, shown as a young man, was modeled in plaster by Partridge in 1901 and cast in bronze in 1914 by Roman Bronze Works, Inc., a New York-based foundry. 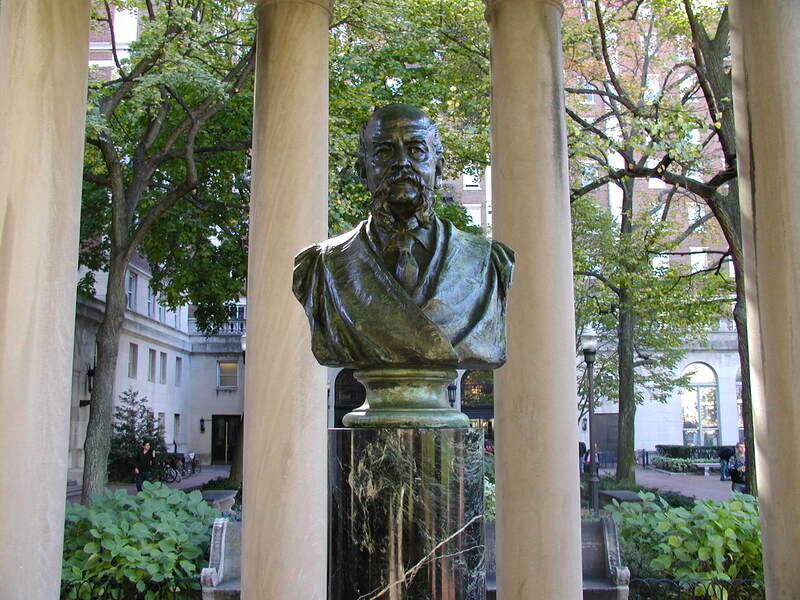 The sculpture was a gift from the estate of Joseph Pulitzer and supplemented by public subscription. 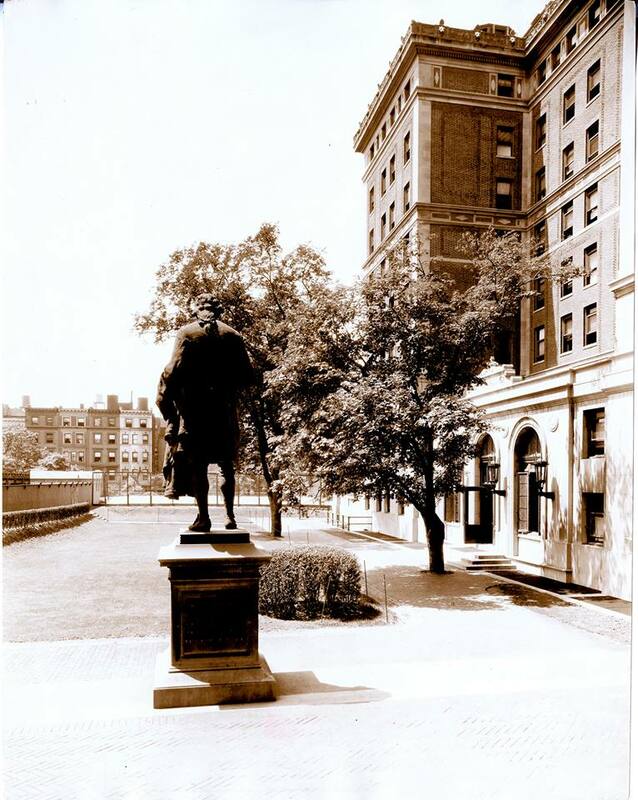 It was installed outside the Graduate School of Journalism and unveiled on June 4, 1914, making it a companion work to Partridge’s statue of Alexander Hamilton, located outside Hamilton Hall. Jefferson stands on a granite pedestal and measures 14 feet in height. The original plaster model, at 20 5/8 inches in height, is in the permanent collection of The New-York Historical Society. This entry was posted in Morningside and tagged Thomas Jefferson, University Archives, William Ordway Partridge on April 25, 2014 by Roberto Ferrari.